Cash-on-cash return, also known as the equity dividend rate, is a commonly used format to evaluate the rate of return on investments in real estate transactions. In the world of real estate, it does not make sense to provide projected Returns on Investment (ROI) when assessing a property, as ROI takes into account all aspects of the investment and you cannot know what a real estate property will sell for at a later date. According to the cash-on-cash return model, the investor will derive a percentage to be made or lost on the investment, based upon the annual returns of the property only in relation to the actual down payment. With cash flow being the oxygen of any business, the cash-on-cash return will provide the investor with the strength of an investment's cash flow. How much am I putting in and what am I taking out? Cash-on-cash is a part of the Lingua Franca used when buyers, sellers, agents discuss the potential returns of properties. How to Calculate Cash-On-Cash Return? Understanding how to properly calculate your cash-on-cash returns is critical to your investment portfolio's success. It is a simple equation that requires the plugging in of the correct numbers to go with it. Due to its simplicity, cash-on cash return can be utilized quickly to evaluate multiple deals in a short period of time. 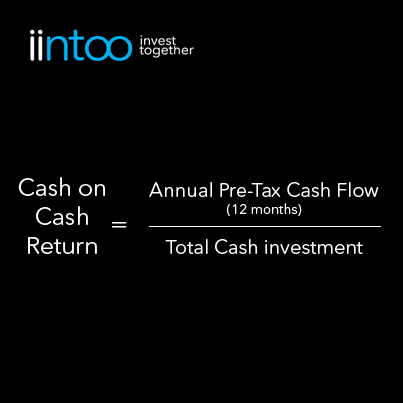 The annual pre-tax cash flow is equal to the net operating income of the investment (Gross scheduled rent and additional other income) minus the combined amount of operational expenses, rental vacancies and debt services on the property mortgages. The cash-on-cash Return is then multiplied by 100% to provide a metric referred to as the cash yield on the property investment. This metric will provide the investor with an analysis for potential cash distribution over the project lifetime. Cash-on-cash returns will fluctuate yearly and therefore this in not a fixed number. Fluctuations will occur based upon macroeconomic changes and market movement, as well as due to property maintenance upkeep costs, rental reviews and vacancies. Keeping your finger on the pulse over time will aid you to come to the correct long term decisions relating to keeping or disposing of the asset. The formula does not acknowledge appreciation or depreciation. Time is not accounted for in terms of currency value as in the case of evaluating the Internal Rate of Return (IRR), or rate of growth over a specific period. The metric does not take into account compounding interest. Tax impacts of the investment on the investor's returns are not calculated. Therefore the cash-on-cash metric should not be the only metric to be utilized in the decision making process when evaluating projects. The initial calculation of the cash-on-cash metric is very helpful to comprehending the financial viability of an investment and will bring the investor a step closer to understanding the asset's potential, prior to them conducting a deeper dive into the numbers and a thorough due diligence process. Would you like to hear more about iintoo? Join us today!